Many students said that even the parties in their manifestos had mentioned youth-centric issues that have stirred up debates at the national level. New Delhi: While some Delhi University students felt that there is a sense of disillusionment among them as the parties don’t fulfil promises after winning elections, others said that the polls will be useful to gauge the mood of the yo-ung voters before the general elections next year. 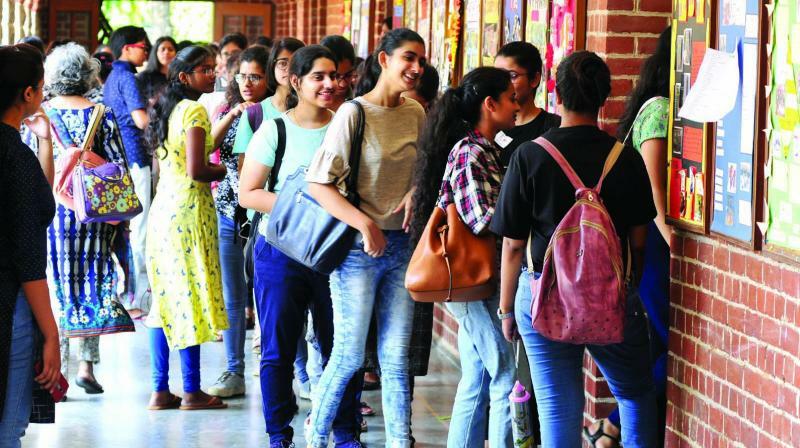 “Students from across the country come to Delhi University to study and the results can actually tell which way the young voters are swaying and what issues they feel are important,” said Manisha, a student of PGDAV College. Many students said that even the parties in their manifestos had mentioned youth-centric issues that have stirred up debates at the national level. This, they said, indicates that the parties are making strategies to woo young voters. However, there were others who said that there is a sense of disillusionment among students as every year the same issues get repeated as promises because they never get solved irrespective of which party comes to power. Among the major organisations contesting Delhi University Students Election (Dusu) election 2018 are National Students’ Union of India (NSUI) — the student wing of the Congress party, Akhil Bharatiya Vidyarthi Parishad (ABVP) — affiliated with the RSS, Aam Aadmi Party’s (AAP) Chhatra Yuva Sangharsh Samiti and Students Federation of India (SFI) — the student wing of the Communist Party of India (Marxist). AAP’s Chhatra Yuva Sangharsh Samiti is jointly contesting the elections with left-wing student outfit All India Students Association (AISA). A member of the NSUI said the DUSU elections are like the “semi-final for the Lok Sabha elections and will show what the young, educated voter wants”. A member of the ABVP said the election results will help the general public and the media in drawing a conclusion about the mood of the voters and also give an idea of what is the trend in the national politics.